Those last-minute meeting requests are proliferating in your inbox, your calendar has triple-parked drinks reception invitations on it, and you’re trying to remember the name of that one restaurant you found last year that was actually quieter than an airplane hangar. Frankfurter Buchmesse is looming, its official dates October 10 to 14 preceded, of course, by the agenda-setting The Markets conference is on the morning of October 9, followed by the afternoon’s 32nd Frankfurt Rights Meeting. Today, a couple of updates from the Buchmesse, with more, no doubt, to follow in coming days here at Publishing Perspectives. 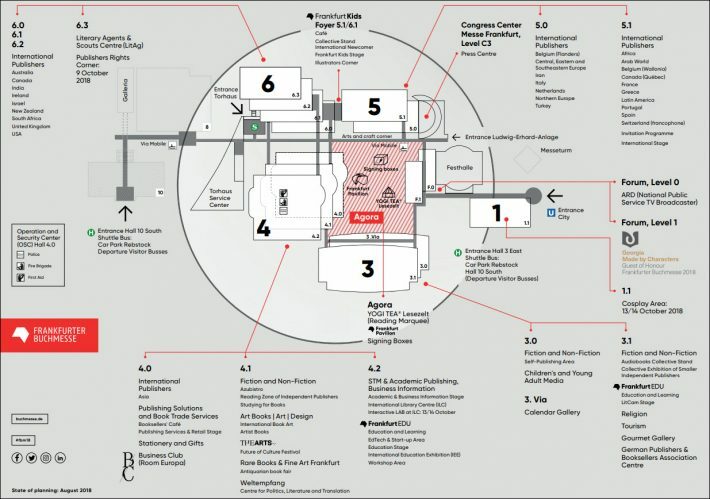 As Copyright Clearance Center’s (CCC) executive director for international relations puts it, “technology and trends” are the focus of programming being presented this year by the fair’s longtime producing partner, and CCC–which will have its stand in Hall 4.2 (E18)—is pointing to several sessions of note. Getting on the Road to Intelligent Content: No Time Like the Present: October 10, 11:30 to 12:00, Education Stage, Hall 4.2 C94: Ixxus’ Carl Robinson, head of consulting, and Renee Swank, senior director for sales, will propose a pragmatic, sensible approach to making the most of technologies without significant upfront investment. Publisher Voices Raised For Copyright, October 10, 14:30 to 15:00, Academic & Business Information Stage (Hall 4.2 N 101): Healy is joined in this session by Michiel Kolman, president of the International Publishers Association, in looking at some of the publishing industry’s most pressing questions, particularly in the realms of advocacy and intellectual property protection. Open Access Monographs, October 10, 15:30 to 16:00, Education Stage (Hall 4.2 C 94): This panel discussion features Brian O’Leary, executive director of the Book Industry Study Group; Ixxus’ Robinson; and David Worlock, publishing analyst and co-chair of Outsell’s Leadership Programs, on the viability, models, and unique needs of open access books compared to journals. Get Smart About “Plan S”, October 11, 09:00 to 09:30, Academic & Business Information Stage (Hall 4.2 N 101): “Plan S” was announced just weeks ago and now many involved in scholarly publishing may be looking for more information on it at Frankfurter Buchmesse. An initiative of 11 European national research funding organizations, “Plan S” puts pressure on open access publishing business models by capping article fees, ending embargoes, and withdrawing support for “hybrid” open access journals. Speaking at this event will be Tim Britton, managing director of Open Research Group at Springer Nature, and more. The beating heart of Frankfurt—the Literary Agents & Scouts Center, or “LitAg”—is going to be transplanted to Festhalle in 2019. 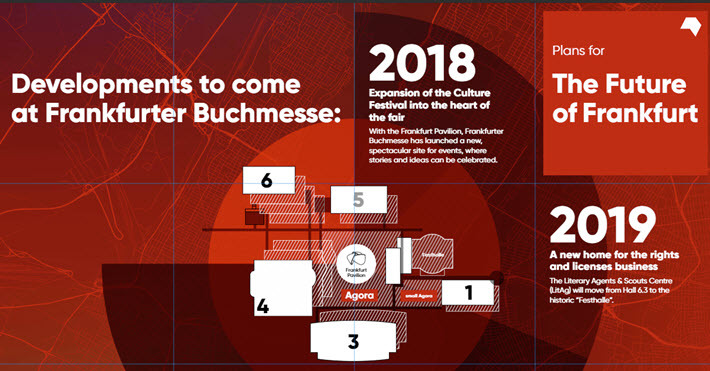 Messe Frankfurt, which fairgrounds facility which hosts the book fair, “will convert Hall 6.3 into a control center” unavailable to consumers, according to organizers. Then in 2020, the international exhibitors from Hall 5 will move to Hall 4, while Hall 5 is rebuilt—a project expected to take until 2023. Hall 1 is to be added to the mix in 2020 with a new glass facade facing the city. The new hall will become part of an area that includes special interest formats geared toward the general public when it arrives for book fair weekend activities. This will also encompass the Agora, the Forum, and Hall 3. More information on the coming changes can be had in this downloadable flyer (PDF). 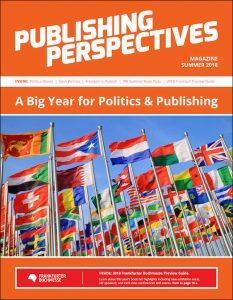 More from Publishing Perspectives on the Frankfurter Buchmesse is here. It includes our extensive preview of the Frankfurter Buchmesse. Download the magazine here.